Significant Terms.. 18+ new players only. 100% bonus on first deposit min deposit £10 max bonus £200. 30x wagering (dep+bonus)30x on spins 4x conversion. Selected slots only. Full terms apply. 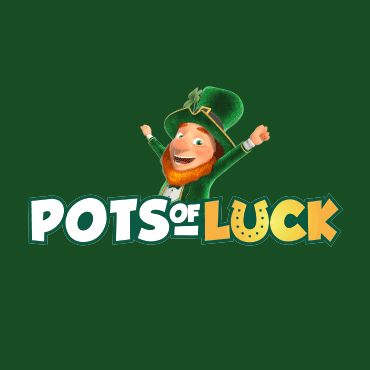 Pots of Luck is a fun, Irish-themed online casino Powered by Nektan, the great gambling operator which also powers successful online casinos such as Jackpot Jones and Monster Casino. Consequently, Pots of Luck’s user interface may seem somewhat familiar if you have explored some of its sister sites. Nektan Limited have a number of successful online casinos for a reason; well received interfaces, appealing themes and good customer service, for example, but they can vary in terms of the spread of games, promotions, etc. We’re here to find out how Pots of Luck fares up. Seamus the lucky leprechaun is the lovable character and face of Pots of Luck online casino. The site is stereotypically Irish; think leprechauns, shamrocks, horseshoes and an emerald green colour scheme. The casino is licensed and regulated by both the UK Gambling Commission and The Government of Gibraltar, where its owner Nektan Limited is based. Pots of Luck is filled with an abundance of online slots varying in themes, paylines, features, and more. Irish-themed slots are favourited of course, so fans of the culture will truly appreciate this site which is compatible with most devices including mobile, tablet and desktop. There are enthralling promotions aplenty also, so if you feel like the Irish could bring you a little luck, Pots of Luck is a must. Pots of Luck has a really impressive selection of games all under one roof; these include online slots and classic casino games. We enjoyed the ‘free demo’ option on many of the games, allowing us to get a feel for our game choices before wagering real cash. Online slots are available in abundance, from high-end providers such as NetEntertainment, and if you’d like to stick with the Irish theme you can’t go wrong at Pots of Luck. Some of Seamus’ top featured Irish slots include Rainbow Riches, Rainbrew, Kiss Me Clover and Rainbow Jackpots. Yes, there are progressive jackpot games too, such as Jungle Jackpots: Mowgli’s Wild Adventure, Golden Goddess and El Jackpotto. Further player favourites include titles such as Peking Luck, Cleopatra and Bonanza Megaways. There are new games added frequently; some of the most recent are Dragon’s Luck: Power Reels, Reel Talent and Mystery Reels. Casino fans will not be disappointed either, as Pots of Luck ensures there are Roulette and Blackjack games aplenty, plus Dreamcatcher and a few other alternative titles. A live dealer does feature, however, at present the only live casino game at Pots of Luck is Live Roulette; perhaps in the future, there will be more options available (something we at Spin Bonus would be pleased to see). Payment methods are readily available for a broad range of player preferences at Pots of Luck. Use the usual credit/debit cards or the majorly popular payment system that is PayPal. Perhaps you’d like to try Neteller, Skrill or Trustly, or use a pre-payment method such as PaySafeCard. Deposits are protected using a strong and secure system, as are withdrawals which are allowed once per 24 hours and take around 3-5 working days to process. The minimum amount you can withdraw is £10, while the maximum is £2000 per day. Three is the magic number, and Seamus offers three fabulous welcome bonuses for all new visitors to casino of the Emerald Isle. First and foremost, register and place your deposit, and you’ll receive a 100% deposit bonus match up to £100 as well as 100 free spins on NetEnt’s Starburst slot. On your second deposit, claim a 200% bonus match up to £50, and 50 free Starburst spins. Last but not least, grab another 50% deposit bonus match up to £200, and an additional 25 free spins on Starburst. This is an excellent start to your Pots of Luck adventure and a pretty decent chance to see if your luck is in! Seamus also likes to present players with further exciting promotions and a ‘game of the week’. Check out which game is featured each week, place a deposit of at least £20 and receive 40 free spins on that online slot. Do check the Promotions section of the website regularly for plenty of seasonal offers, free spins, bonuses and more. Players who become VIP as a result of consistent loyalty to the site are sure to be impressed with the resulting rewards. Those players will have dedicated customer service, exclusive bonuses and promotions, VIP hospitality and much more. Climb the ranks from Silver VIP status up to VIP Elite (there are 4 levels in total) to see those rewards get bigger and better. As expected, the more time you spend at Pots of Luck and the more you wager and play, the higher you’ll climb in the VIP ranks. Should players encounter any issues while playing at Pots of Luck, a great level of customer service can be expected. There is a friendly and professional customer support team on hand, who can be contacted via email, telephone or live chat. The team isn’t available 24 hours a day unfortunately. However the hours of operation are generous from 8am until midnight. The team endeavour to respond to emails within 24 hours, and there is a handy FAQ guide to utilise too. Pots of Luck is a well-designed, cheerful and vibrant website that is pleasing to navigate; this is thanks to the years of experience Nektan Limited has had managing online casino platforms. Players on mobile devices, tablets and desktops including Windows and Mac PCs can expect a quality experience in terms of site navigation, pages loading at speed and great quality graphics and software within the games. View a banner at the top of the main page with latest promotions and VIP information, and a permanent games menu directly underneath for fast access to favourites, new games, casino games and more. 18+ new players only. 100% bonus on first deposit min deposit £10 max bonus £200. 30x wagering (dep+bonus)30x on spins 4x conversion. Selected slots only. Full terms apply. Up to £500 in bonus cash or 999 Free Spins!